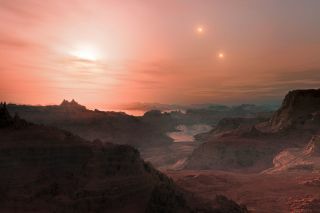 This artist’s impression shows a sunset seen from the super-Earth Gliese 667 Cc. The brightest star in the sky is the red dwarf Gliese 667 C, which is part of a triple star system. The other two more distant stars, Gliese 667 A and B appear in the sky also to the right. Astronomers have estimated that there are tens of billions of such rocky worlds orbiting faint red dwarf stars in the Milky Way alone. Though these alien planets are difficult to detect, and only a few have been discovered so far, they should be ubiquitous, scientists say. And some of them could be good candidates to host extraterrestrial life. The findings are based on a survey of 102 stars in a class called red dwarfs, which are fainter, cooler, less massive and longer-lived than the sun, and are thought to make up about 80 percent of the stars in our galaxy. Using the HARPS spectrograph on the 3.6-metre telescope at the European Southern Observatory's La Silla Observatory in Chile, astronomers found nine planets slightly larger than Earth over a six-year period. These planets, called super-Earths, weigh between one and 10 times the mass of our own world, and two of the nine were discovered in the habitable zone of their parent star, where temperatures are right for liquid water to exist. "Our new observations with HARPS mean that about 40 percent of all red dwarf stars have a super-Earth orbiting in the habitable zone where liquid water can exist on the surface of the planet," team leader Xavier Bonfils of the Observatoire des Sciences de l'Univers de Grenoble in France said in a statement. "Because red dwarfs are so common — there are about 160 billion of them in the Milky Way — this leads us to the astonishing result that there are tens of billions of these planets in our galaxy alone." The two stars found inside the habitable zone were discovered around the stars Gliese 581 and Gliese 667 C. The latter planet is the second of three worlds orbiting its star, and seems to lie right in the middle of Gliese 667 C's habitable zone. Although the planet has four times the mass of Earth, it is considered the closest twin to Earth found so far. This and other planets are good candidates for follow-up studies that aim to analyze the atmospheres of these worlds for signs that organisms are living there. "Now that we know that there are many super-Earths around nearby red dwarfs, we need to identify more of them using both HARPS and future instruments," said team member Xavier Delfosse. "Some of these planets are expected to pass in front of their parent star as they orbit — this will open up the exciting possibility of studying the planet's atmosphere and searching for signs of life." However, there are some issues with looking for life around red dwarfs. Since these stars are cooler than the sun, their habitable zones are much closer in than ours. That puts any planets there at risk of being hit with stellar eruptions or flares, which are common on red dwarfs. Such flares could release X-rays or ultraviolet radiation that could harm or inhibit the development of life, scientists say. The new findings will be described in a paper to be published in an upcoming issue of the journal Astronomy & Astrophysics.